When: July 18 to August 11. Official opening on Friday, July 18, from 7 to 8:30 p.m.
Peachland residents and visitors are invited to come to the Yellow Schoolhouse Exhibition at the new Peachland Community Arts Council gallery in the primary school in Peachland, from July 18 to August 11. UBC researchers and artists will open a month-long interactive space where work from local artists will be displayed along with various activities that gallery visitors can enjoy, including a series of take-home or do-it-on-site projects. The goal of the Yellow Schoolhouse project is to make art and generate conversation about Peachland and the Okanagan. How do Peachland residents experience their place? Can we imagine possibilities for development and growth in the community? The Yellow Schoolhouse show is a chance for people to explore and imagine this place and to share these ideas with others. All the work created will be documented and preserved so there will be a record of what people thought about Peachland in the summer of 2014. Also on display are paintings, poems, and sound recordings that were created in a series of workshops inspired by local Peachland Community Arts Council members in conversation with interdisciplinary performance Assistant Professor Denise Kenney, and Holmes, who teaches creative writing. 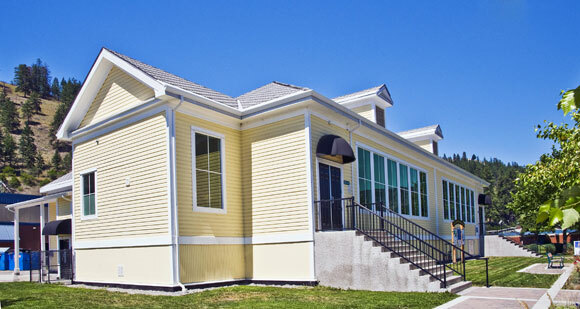 The Yellow Schoolhouse Exhibition is located in the newly renovated primary school at 5864 Beach Avenue, in Peachland. Celebrated for sheltering in its attic the largest Yuma bat colony in BC, the building is a perfect space for the Yellow Schoolhouse Exhibition, says Holmes. Everyone is invited to the opening on Friday, July 18, from 7 to 8:30 p.m. The exhibition will be open for three weeks to the public and is free admission. This project was developed through the Eco Art Incubator and the Okanagan Sustainability Institute, and is supported by the Social Sciences and Humanities Research Council and the Peachland Community Arts Council.